We had one of those BLAH weekends. Miller and Mitch were sick. We were all a little grumpy. We did go trick or treating, but just down the street. The kids did not seem to mind. They were just excited to get candy and see other kids all dressed up. 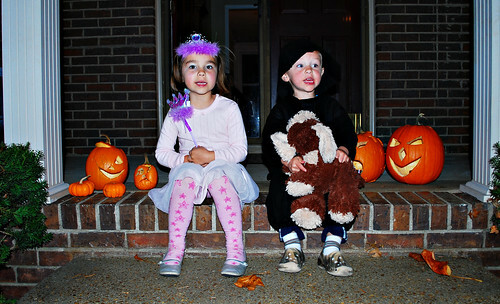 This was the only not even decent shot I got of the kids dressed up. They were just not cooperating and then it was dark. I know you all understand how it goes. Hopefully, I will be back next week with a Best Shot. Very cute! I think one of the really fun parts of Halloween is getting to see what the other kids have dressed up as. Sorry to hear about the sickies...hopefully everyone gets better real soon. Aw, I hate it when stuff like that happens...but, yes, I SOO know how you feel...remember my dreams of amazing wedding photos at my SIL's wedding...yeah, I got nothin!! But, you know, I tell myself this ALL THE TIME (have to remind myself): The most important thing is that I'm able to capture the moments in my kids lives...good pictures (like this one), bad pictures or great ones...doesn't matter...at least we've captured them! Hope everyone is back to feeling good again!!! I'm so sorry to hear that you'r guys have been sick this weekend. I hope everyone is feeling better. I am glad that you got a picture of Harper though. She and Miller are adorable. Sorry for the crappy weekend! ugh. The kiddos are still adorable!! I love Darth Vadar with a stuffed animal! :0) That is so cute. At least they're sitting next to each other and not pouting like my little ghost. ;) I like the jack o lanterns. I'm so miss those as we didn't do a single one this year. I as well had grandiose ideas about the perfect Halloween Shot (no such luck). The pumpkins look like they were pretty cooperative.